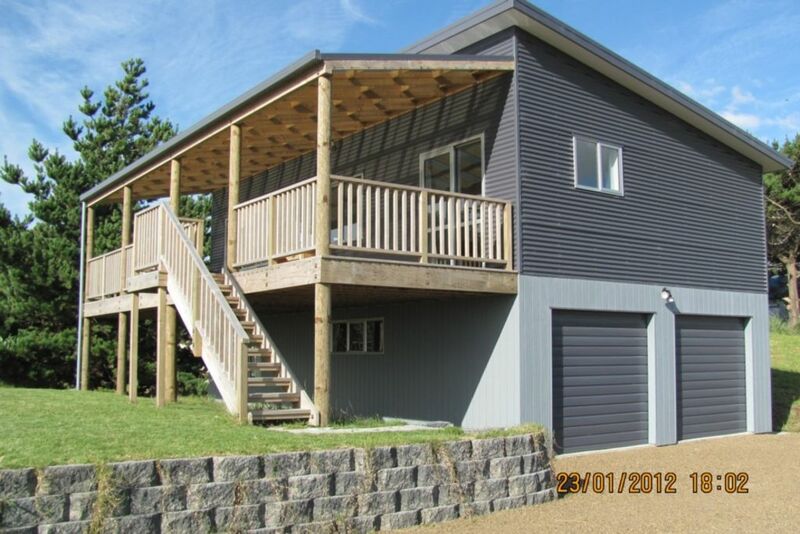 This new 2 storey Bach is just 800m from Hokio beach. Upstairs has 2 bedrooms, separate shower, WC and vanity room, as well as an open plan kitchen-dining-lounge area flowing onto a large covered deck. The view from the top storey is over rural farmland to the sea - great sunsets. Relax and enjoy with an espresso or cappuccino from the coffee machine. Downstairs has a garage with laundry, a second WC and the 3rd bedroom/lounge area. Hokio stream is a popular White baiting location in season (August - November). There are views to the Tararua mountain range 15kms to the East and an 18 hole championship golf course just 4km down the road. If you need to hit the shops or go to the cinema, it's only a 10min drive into the Levin shopping centre. Hokio beach has a wonderfully remote feel to it as the village itself is alomst invisible from the beach. This is a great place to get away for a break, just 40mins from Palmerston North and 75mins from Wellington. You won't be disappointed.